Description: The fun jet was actually introduced 2 years before there even was an airport. Where was it going to land or take off? It was the first set to introduce the standard luggage pieces that would later show up in the #996 Airport and it's successors when they finally came along. When originally introduced in 1970, the plane did not have a gas hole on it's wing nor a tow hook near the front wheel. These features were added in 1972 due to the introduction of the #996 Airport to become compatable with the airport's fuel car. After a lengthy run of a decade, #183 was discontinued in 1980 and the more sleek, tinted-window (and self-piloted) #182 took it's place beginning in 1981. 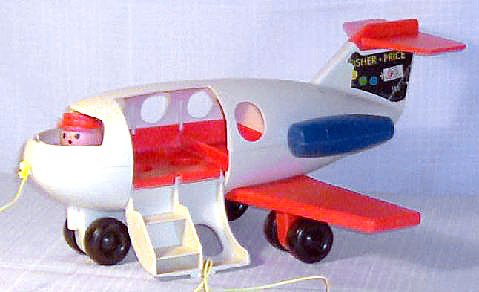 FPT657 - Large white "jumbo-jet" style 4-seat plane with a hinged side door, red wings and interior, blue engines and attached pilot in the cockpit. Right side wing wheel makes "whirring" sound when plane rolls. The attached pilot in the cockpit turns his head from side-to-side when the plane rolls. This plane DOES NOT have a gas hole on it's wing nor a tow hole on the nose of the plane. FPT303 - Round Lime Green "hatbox" style suitcase. FPT304 - Yellow square suitcase with a small top carrying handle. BQWW or BQWP or BQPP - Green dad with black heat-stamped hair. FNWW or FNWP or FNPP - Blue mom with fancy eyes and a blonde ponytail. CUWW or CUWP or CUPP - Orange boy with red heat-stamped hair. FGWW or FGWP or FGPP - Blue girl with blonde braids. FPT580 - Large white "jumbo-jet" style 4-seat plane with a hinged side door, red wings and interior, blue engines and attached pilot in the cockpit. Right side wing wheel makes "whirring" sound when plane rolls. The attached pilot in the cockpit turns his head from side-to-side when the plane rolls. This plane has a gas hole on it's wing and a tow hole on the nose of the plane (to become compatable with the accessories sold with the 1972 introduction of the #996 Airport). FPT3926 - White airplane with red wings, red interior, red engines and an open cockpit. This plane may be a catalogue exclusive, as we have never seen a white plane with red wings, interior, and red engines. FFPP - Blue girl with brown sculpted bob. Retail price in the 1971 J.C. Penneys Spring and Summer Catalogue was $4.88. Also see 1981's #182 Jetliner. 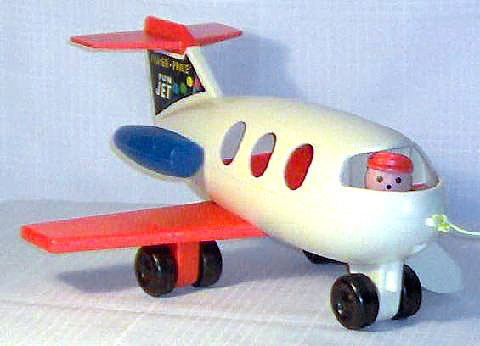 Also see 1986-1989's #2360 Little People Jetliner.